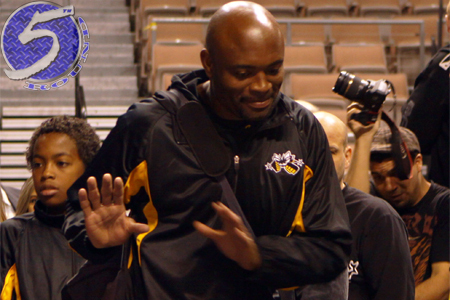 Prior to getting knocked out by Chris Weidman at UFC 162, many pundits wondered if then-middleweight king Anderson Silva (pictured) would call it a career after adding to his UFC record 11th straight title defense. I mean, what did the 38-year-old have left to prove at that point? Weidman subsequently served up an upset special with a left hook that put the UFC’s most decorated champion to sleep to steal his crown. The retirement word came up again, but this time it was because some wondered if Silva had all of a sudden grown old overnight. Silva said he would continue fighting, but was no longer interested in competing for the belt. Huh? So, what’s the point then? Silva then had his infamous, “I back. Trust me, I back,” interview shortly after and the biggest sequel in UFC history was immediately arranged. With Silva set to rematch Weidman in just two days, hoping to erase the nightmare from only five months ago, the Brazilian claims the R-word hasn’t entered his mind. And most importantly, hasn’t entered his heart. “After the dust settled after the last fight, I was sitting thinking alone and thinking,’ Maybe I should stop. Maybe this is it,'” Silva stated during Thursday’s the post-fight press conference. “But I got on the phone with my son and my son said, ‘Hey, dad. Do what you want to do, do what makes you happy,’ and that’s what I’m doing. Another lights out loss to Weidman could have Silva’s heart thinking enough’s enough. On the flipside, a highlight reel finish of his own to knot up the score could put “The Spider” train right back on track. UFC 168 goes down Saturday night inside MGM Grand Garden Arena in Las Vegas, Nevada.